Our intervention here is to help clients describe with true clarity what their strategy is, what the ideas are behind it, what the business drivers are which it deals with and how they can communicate all of this in a way that everybody in the organization can understand it. We are not a McKinsey; we do not try to change strategy or to tell clients how to run the business (although sometimes greater clarity leads our clients to change elements of their strategy). 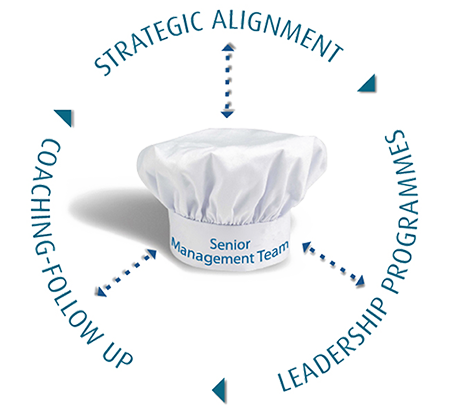 What we do is help them clarify and communicate it so that we can facilitate the organizational changes and develop the leadership necessary to get it executed. When our clients come to developing their leadership, they get their money’s worth. Describes with precision the strategy. Clarifies the logic behind it and its fundamental purpose. Designs a communication plan to get it out to every corner of the organization. This process leads to great clarity and lays the groundwork for achieving the type of alignment that supports the execution of the strategy.